Teen People. Buffy the Vampire Slayer. The Left Behind Series. Ghost World. These titles may seem to have nothing to do with each other-but they may be the best ways to connect with teens. Teenagers! Here are proven strategies for linking teens and reading, including using fiction, nonfiction, booktalking, school resources, book promotion, training, and online resources. Reynolds shows you how to develop a "Personal Reader's Advisory Strategy" for YAs-recognizing their reading habits and providing programs and services that meet their needs. The interspersed "Reading Scenes"-success stories, day-to-day accounts, and quick tips-cover "cutting-edge" teen reading choices. Tip-filled sections cover every genre and format: manga, teen realism, series books, graphic novels, sci-fi and fantasy, nonfiction, instruction books, magazines, and more. Suggestions for more effective booktalks, teen spaces, book displays, promotion, discussion groups, school programs, technology (readers' databases, Web pages, teen chat) that will make any library more appealing to a young adult audience are included. This unique resource will help you turn the teens in your community into readers and lifelong library users. About Tom K. Reynolds (Author) : Tom K. Reynolds is a published author. 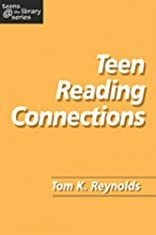 A published credit of Tom K. Reynolds is Teen Reading Connections (Teens @ the Library Series) (Teens @ the Library Series).